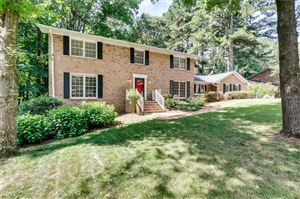 Spectacular newer construction Morningside home built in 2015 - a short walk to Piedmont Park/Beltline/restaurants! Gourmet kitchen opens to great room w coffered ceiling & fireplace. Professional-grade stainless steel appliances. Upstairs hosts 4 bedrooms all w en-suite baths including a deluxe master bedroom w spa-like bath. Fully finished basement w media room/bath/bedroom. Private screened porch & fireplace adjoining beautifully landscaped backyard with pond/waterfall & outdoor kitchen. Hardwood floors throughout! Topped off w rare 3 car garage & quiet street.